On the other hand Vicky, the cookie lady, hasn't yet made a pilgrimage to Caracas. Something about paying her own way perhaps? At least this saves some CO2 i hope. Here is a wild and crazy thought, expounded to me by someone over a pool game at the bar. One of the TVs is on a news channel (sound off, of course, only games have sound on) and the crawler sez sumpn about venezuela. The guy looked at it, and said, "The whole thing is a TV show. Trump is a TV show. Remember the Apprentice show ? He can't fire 'em till he hires 'em ! Same with war, he cant stop a war if he don't start it first. Bet he steps in and stops this one b4 the troops go in." Then he blew the chalk off the tip of his cue, and proceeded to clear the table. i think there is truth to it. How he runs his whole presidency is very TV-showesque. And i hope your friend is right with the "steps in and stops this one b4 the troops go in" part. "Well you know Hillary Clinton got three million more votes. We're gonna recognize her as the legitimately elected President United States. We're not going to talk to Trump." While the Democrats seems to love it, the rest of the people have shown greater disdain. I believe this year will be made up of much posturing between the parties, and I think the Democrats are fighting an uphill party on this front. So, democrats gave Trump 1.7 billion for the wall? What? Why? Don't they know the whole wall is a scam? It is also not near the money he wants and he is not wired for compromises so it might be a 1.7B rope. Donald Trump's tax cut was a massive giveaway to large, profitable corporations and wealthy Republican campaign contributors. Trumpism isn’t about a border wall, any more than it’s about patriotism or conservatism. It’s about unshakeable faith in one man. Last time that happened, we had to fight a World War to get back to reason. while i agree with you in general, is it literally unconstitutional? I mean, yeah, it should be unconstitutional but is it really? For how i see it, the constitution has a lot of wiggle room so a president that wants to act authoritarian is not explicitly forbidden to do so. But i'm not an expert on the constitution and am very thankful for every input on the topic. Hilarious. They are not only faking Trump's height (4:50 ff in video) but even his finger length (8:49). "President Donald Trump offered a clear, historical precedent Friday for deploying the U.S. military with no provocation. " "What I’m doing is entirely in keeping with the way that the U.S. government usually acts"
"I would quote the words of Noam Chomsky ..."
Boy, the onion is brutal. But someone needs to say it. The Constitution has no clause that gives the president emergency powers. This was a deliberate and wise choice. The framers of the Constitution wanted to make sure that its requirements, including checks and balances, are enforced even in times of crisis. Indeed, when prior presidents have tried to claim inherent power to deal with emergencies, the Supreme Court has rejected such claims. In the end, any funding for Trump's wall would need to be approved by Congress, regardless of Trump's declaration of an emergency. Since Congress is split right now, any claimed extra powers by Trump will have to be decided by the third branch of the government : The Legislature. So, yeah, there will be some lawsuits. ... The use of military forces to perform domestic functions — such as constructing barriers along the US-Mexico border — could pose fundamental legal, policy and administrative challenges. “Military forces operating freely within civilian jurisdictions risk upsetting the constitutional balance between civil authority, the military, and the private sector,” the Army said this week in a newly updated manual. Therefore, “Army leaders must ensure that even in a catastrophic event, Army support remains within the boundaries of constitutional principles, U.S. laws, DOD policies, and Army regulations,” the manual said. See Defense Support of Civil Authorities, Army Doctrine Publication 3-28, February 11, 2019. The link is about the alternative 11 cities tour (200km iceskating). The quote at the end there is weird because any dutch skater would love to do it in Friesland with no mountains in sight. 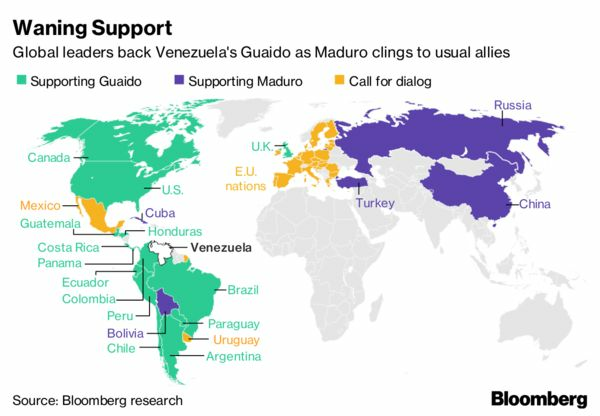 European MPs arrived in Venezuela on Sunday and were supposed to stay until Tuesday to carry out a series of meetings, including with Guaido, the leader of the opposition recognized by a number of European governments as the legitimate leader of Venezuela. One of the more noteable remarks came from former U.S. Secretary of State John Kerry: "We are currently living out, by acts of omission and commission, a mutual suicide pact on this planet,"
The precise timing of the announcement is subject to change. The scope and contours of what Barr will send to Congress remain unclear. Also unclear is how long it will take Justice officials to prepare what will be submitted to lawmakers. More from Munich: Lindsey Graham no longer licking Trump's boots? Might be the first sign of the end of Trump. This could go in many threads. Hopkins at dissidentvoice on Trump, Empire, media and much more: "Maybe Donald Trump isn’t as stupid as I thought." "So how did Trump finally get the liberal corporate media to stop calling him a fascist? He did that by acting like a fascist ..."
"Unfortunately, there is no America. There is nothing to make great again. “America” is a fiction, a fantasy, a nostalgia ... What there is, in reality, instead of America, is a supranational global capitalist empire, a decentralized, interdependent network of global corporations, financial institutions, national governments, intelligence agencies, supranational governmental entities, military forces, media ... "
"Corporations, especially multi-billion dollar transnational corporations ... have no nationalities, nor any real allegiances, other than to their major shareholders ...Do you really believe that being nominally headquartered in Boston or New York makes these companies “American,” or that Deutsche Bank is a “German” bank, or that BP is a “British” company? " "There are no more sovereign nation states. Global capitalism has done away with them." Sovereign states have some autonomy but global capitalism does punish them for it. Prime Minister Jacinda Ardern has announced a ban on military style, semi-automatic (MSSA) guns and assault rifles in the wake of the Christchurch mosque shootings. All semi-automatic weapons used during the terrorist attack on Friday will be banned, she said. Related parts used to convert the guns into MSSAs would also be banned, along with all high-capacity magazines. She expected the amendments to the Arms Act to be in place by April 11. An amnesty will be put in place for weapons to be handed in. President Trump asked what the United States could do and received an answer he can’t have been expecting. “Sympathy and love for all Muslim communities,” the Prime Minister told him. Mueller done, no more indictments. Jared, Ivanka, Don (sr and jr) and the rest walk. Of course, expecting the guy who did the bulger coverup to actually do anything embarassing always was a losing game. Sorta like waiting for Holder to indict torturers. Like the bookie at the bar sez: the fone call came down, the fix went in, long b4 the game started. "Still most people in town are like the Smiths, the so-called "forgotten people" who support the president and believe that the special counsel, members of Congress and others in Washington just get in his way. President Trump shockingly supported the blockade of a key US ally in the region, forcing many within his own Administration and the GOP to question the move publicly. "Lawyers for an American journalist who believes he was placed on the government's infamous "kill list" warned Tuesday that the rights of all U.S. citizens are at stake "
"Kareem joined an Al Jazeera journalist in 2017 in a lawsuit against the government, demanding that the Trump administration remove their names from the "kill list" of potential targets for the U.S. drone program." "By invoking the state secrets privilege in the context of designating a U.S. citizen for lethal action, the government seeks to shield itself from all inquiry into the process by which it acts as prosecutor, judge, jury, and executioner of plaintiff Bilal Abdul Kareem,"
"The government, in its motion to dismiss, said that Kareem's due process rights would be satisfied simply by allowing him to present evidence that he has been wrongly placed on the kill list, and that the government was under no obligation to repond." " it was akin to "limiting the accused to unilaterally contending that he is innocent of unknown charges in the hopes of persuading a silent, opaque coterie of government officials not to kill him." "
Rep. Devin Nunes, the ranking Republican on the House Intelligence Committee, announced last week he was sending eight criminal referrals to Barr regarding abuses committed by the FBI and DoJ during the Russiagate investigation – including three that involve efforts to mislead and abuse the FISA courts. Nunes' committee has been looking into FBI and DoJ malfeasance in the Trump probe since 2017. And the sad thing is: He has a point. There was a witch hunt, but Trump is a witch. And the only way to beat a witch is by neutralizing its spells. What's even sadder, is that he has clearly come to an agreement with the establishment pushing for a coup, which explains why Mueller has been whistled back and it's all about the collusion with the commies, not the corruption with myriads of parties from different nations. It's all a distraction, on purpose. And people fall for it, because they don't want to do the hard work of developing a vision based on universal principles that always stands, no matter the conditions. Meanwhile, it seems Trump's recognition of Israel's sovereignty over the Golan Heights (i.e. forceful annexation of territory from Syria) will have, as usual, unintended consequences. Do not be surprised if Russia (Crimea, the Arctic(?)) and China (South China Sea) say "what's sauce for the goose is sauce for the gander". I am continually surprised that I am surprised on how much real damage Trump and his cohorts are able to inflict on this tired old world of ours. Trump’s action risks a breakdown in global norms, giving a green light not just to Russia’s seizure of Crimea, but wars of conquest around the world. Watch Ben Dixon being brilliant. Lets see if house/senate can override the veto, or even have the guts to try. "Carter told a church congregation this weekend that he had spoken with President Donald Trump about China on Saturday, and said the commander in chief was worried that Beijing had outpaced its global rivals." "Carter said he did not “really fear that time, but it bothers President Trump and I don’t know why." "
"Carter—who normalized diplomatic relations between Washington and Beijing in 1979—suggested that China’s breakneck growth had been facilitated by sensible investment and buoyed by peace." " “Since 1979, do you know how many times China has been at war with anybody?” Carter asked. “None. And we have stayed at war.” The U.S., he noted, has only enjoyed 16 years of peace in its 242-year history, making the country “the most warlike nation in the history of the world,” Carter said. This is, he said, because of America’s tendency to force other nations to “adopt our American principles.” "
"In China, meanwhile, the economic benefits of peace were clear to the eye. “How many miles of high-speed railroad do we have in this country?” he asked. " Carter: the best ex president the USA ever had.